During this week, I will be publishing what amounts to a leader’s manifesto – some thoughts and insights into what it takes to be a successful leader – how to get more out of yourself, your Team and your organisation. Feel free to feed back, and if you like what you read, please do share it with others who might find it useful! Have you ever wondered where you are going in life? Have you ever sat behind your desk, or walked through your business, and asked yourself ‘Where am I headed? What’s my purpose? Are my goals congruent with the direction I’m taking?’ For many of us, ‘the meaning of life’ is not just a film title, it translates into the less grand, but no less important, sentiment of ‘What should I do right now? And how do I decide?’ Faced, like a mother bird, with all those hungry mouths to feed – team members looking for direction, Clients asking for service, stakeholders and creditors looking for value – where do we look to find direction, so that we can set the course, make decisions and lead? As leaders, knowing where to go fundamentally requires knowing (a) where we WANT to go (PURPOSE) and (b) how to get there. Knowing our purpose enables us to set our course and work out (b)! And, crucially, communicating that to others, i.e. feeding those hungry mouths. Many years ago, I was asking myself those ‘where am I going?’ questions – I’d just graduated from university and among other things I needed to decide ‘what to do with my life’. More pressingly, at this precise moment I was sitting on a block of ice, in a blizzard, in front of what looked like an alien space craft, covered in snow and ice, and which occasionally emitted rather scary whirring sounds, as if to warn me and my oldest friend of some unknown terror to come. 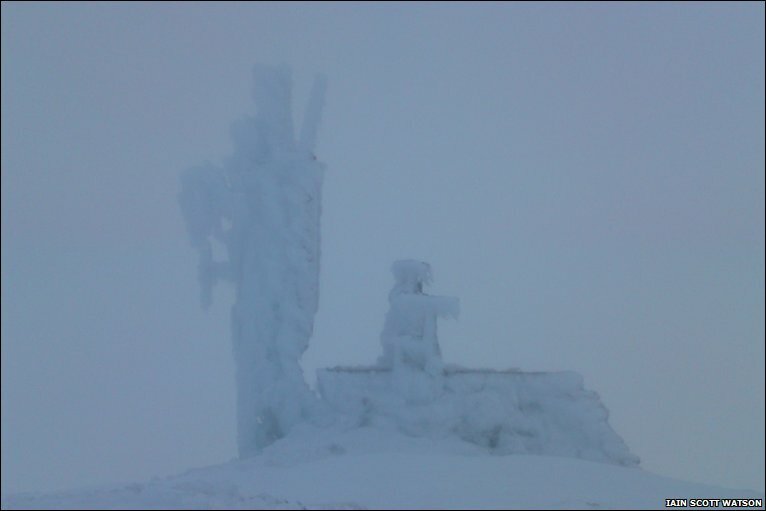 In fact the ‘space craft’ was the Automatic Weather Station that is situated on the summit of Cairn Gorm and records wind speed, direction and temperature in the UK’s most severe climate, on the highest, coldest and snowiest plateau in the UK, in the remote wilderness that is the eastern Highlands of Scotland. The two of us had enlisted in a Winter Mountaineering course at Glenmore Lodge, Scotland’s National Outdoor Training Centre, and after a day and a half’s instruction found ourselves alone, on the 1245m summit, half way through what was for us a demanding test of the skills we had learned – ‘winter movement’ with ice axe and crampons, avalanche awareness and of course, navigation. The answers – not all of them apparent at the time, in what you might call ‘the LACK of the heat of the moment’, were as follows: I was there to stretch myself, to experience new things and to learn new skills. We were going to follow the ridge down to the safety of Glenmore Lodge, where warmth and sustenance awaited. And we got there, by using the navigation and movement skills we had learned, keeping ‘cool’ (!) under pressure by drawing on the experience we had gained on the course and on previous expeditions, and focusing all our energy and commitment to staying on course and reaching that destination. And no, this isn’t a ghost story, we did make it down safely! And, reflecting on that experience, when disaster was literally one or two mis-steps away, it is clear to me now that our trusty COMPASS – the one piece of navigation equipment we could actually use in those conditions – was, both literally and metaphorically, the key to our successful descent. And that got me thinking about the nature of Compasses. As most people know, Compasses are used to determine the direction of true North. However, the Compass reading must be corrected for two effects. The first is magnetic declination, the angular difference between magnetic North (the local direction of the Earth’s magnetic field) and true North. The second is magnetic deviation, the angular difference between magnetic North and the Compass needle due to nearby sources of interference such as magnetically permeable bodies, or other magnetic fields within the field of influence. Put simply, if the Compass reading is distorted – even by one or two degrees – then depending how narrow the path, or how far one is travelling, the result can be a massive deviation from the intended destination. In our case, we might well have fallen off that ridge and ended up as frozen as those Mars Bars. On the other hand, by having a clear objective (purpose/target), tools (organisation/resources) that are fit for purpose, and applying our skills and experience in appropriate measure, we can be confident of success. If our internal Compass is correctly calibrated, we can follow it – to the fulfilment of our own daily lives, and as credible and compelling leaders. Yes. This is of capital importance when it comes to fulfilling purpose and pursuing a vision.